I make my leather dog collars to a traditional style as I described in an earlier post. 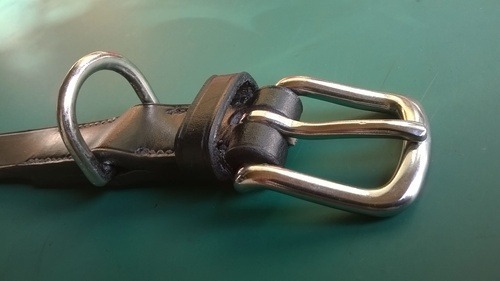 The buckle is on the end with a leather loop to keep the point of the leather in place. A Dee is then stitched in enabling your lead and tag to be attached. 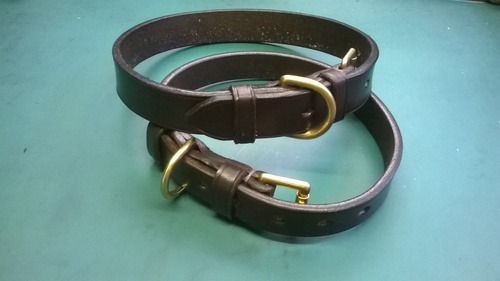 My leather dog collars are cut from English Bridle Leather. This is one of the best leathers in the world! As its name suggests Bridle leather is used to make horse bridles, so you can just imagine how strong the leather needs to be when used on a horse. This makes leather the perfect choice for your dog collar; strong, supple, and long-lasting! I use either solid brass or stainless steel buckles to ensure that my leather dog collars do not rust. Why have a really good piece of leather and then fit poor quality buckles! Brass buckles are dog collar roller buckles from Abbey England and my stainless steel buckles are West End buckles, also from Abbey England. The dee is either solid brass, stainless steel or nickel. 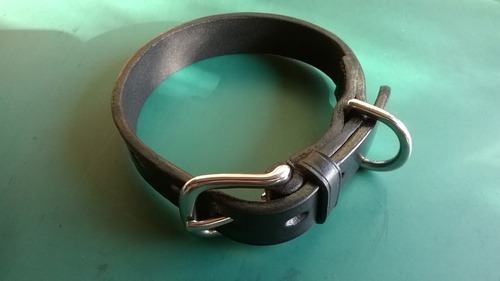 I punch 5 holes through the leather to enable you to buckle your leather dog collar. These holes are oval as it allows the buckle pin to sit flatter against your dog making the collar more comfortable and giving a smoother appearance. If you have measured correctly your dog’s collar will buckle up to the middle hole leaving two holes either side. The tail end can be held in place by another loop if required. How long should your dog collar last? This is a question I am often asked. With proper care your collar should easily last your dogs lifetime. My old dog had his collar over 15 years and it was still going strong. So why buy a cheap, throw away collar when you could buy one from Oakside saddlery that will last a lifetime! Go on, order one today! Tags: "leather dog collar" handmade "hand stitched" made in england" "made to order"